You can pay with Apple Pay instead of cash and now you'll be able to use your iPhone as a subway pass, too, making your leather wallet good for nothing beyond being a Costanza filing cabinet. The Near Field Communications (NFC) Forum, which includes Apple, and the American Public Transportation Association just came to a "formal understanding" to work together, which means NFC technology, like the one that powers Apple Pay, will soon allow you to use your phone at subway turnstiles and bus card readers. According to the Business Wire announcement, "NFC technology provides a wireless connection between mobile devices and wireless readers such as those seen in gated fare collection for public transit systems. The adoption of NFC will enable a global public transportation environment in which passengers board with unprecedented speed and ease." This means that sometime in the near future, mobile devices will replace the need for metro cards, which keeps in line with January reports that claimed New York's MTA is on its way to using an NFC payment system by 2018. This new deal between the APTA and the NFC Forum should mean more big cities adopt NFC as well. In a statement, NFC Forum Chairman Koichi Tagawa echoed the sentiment: "NFC will not only streamline fare collection but also make transport operations more seamless, efficient, and responsive. We look forward to working with APTA to bring these benefits to operators and their passengers worldwide." 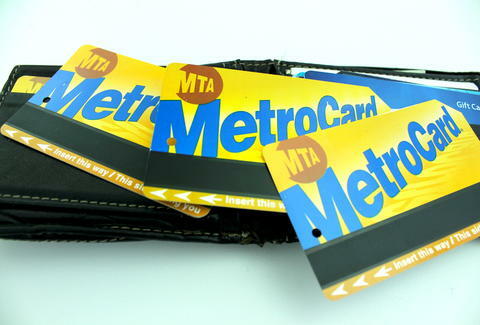 So, soon you'll never have to worry about losing your recently loaded metro card again. You'll just have one more reason to worry about losing your iPhone -- as if that weren't already the worst thing ever. Kara King is a News Writer at Thrillist and needs to clean out her wallet. Send news tips to news@thrillist.com and follow her at @karatillie.